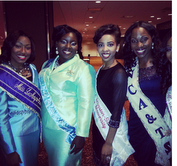 ST.THOMAS- Miss University of the Virgin Islands, Murchtricia Charles represented the University of the Virgin Islands in the Miss National Black College Alumni Hall of Fame Competition from Sept. 25 – Sept. 29 at the Hyatt Regency Hotel in Atlanta, Georgia. Charles, whom was accompanied by Student Affairs representative Leon Lafond and Cherie Wheatley, competed for the title against 29 other college queens from Historically Black Colleges and Universities around the country. She received an abundance of support from the UVI community and the Virgin Islands as a whole. “The preparation process for Miss UVI’s participation in the National Black College Alumni Hall of Fame competition was a blessing. We had been meeting with Mrs. Lisa Wynn-Magnuson, director/owner of The Virgin Islands Etiquette & Leadership Institute who also participated in the same competition several years ago and came in first runner up. Mrs. Magnuson has been consistent with preparing Murchtricia Charles for this event,” Lafond said. Charles took the initiative to do plenty of research on her own and other preparations to educate herself for the competition that is a part of the university’s tradition. “Truthfully, I was terrified going into the competition however I saw how welcoming everyone was and it enabled me to open up and be comfortable. The experience was educating and phenomenal overall. I left with new plans for student leadership for the University of the Virgin Islands,” Charles said. Charles was excited about representing both the Virgin Islands and the University of the Virgin Islands amongst the other Historically Black College and Universities at the competition. Charles was actively involved in the various sessions/workshops as part of her ambassadorial role at the competition in addition with the other queens. She participated in events such as the Queen’s Tea Party, visited local schools in Atlanta, personal interviews, and the Positive Image program. “It may seem like a lot but Murchtricia Charles was fully prepared to partake in these events,” Lafond said. The competition featured women who have been recognized by their respective colleges or universities with the coveted title of “College Queen.” The winner would carry the title of Miss NBCA Hall of Fame. In addition, the competition provided an opportunity for young women attending our nations Historically Black Colleges and Universities to better prepare for the future. Though the program places emphasis on excellence, achievement and personal growth, it also strives to make the experience fun. “There weren’t many challenges in our preparation process. I, along with her chaperone Ms. Cherie Wheatley, her other family and friends, especially her brother Jamal Drummond has been very supportive to her throughout the process,” Lafond said. Miss University of the Virgin Islands 2012-2013, Ivory Carter represented the Virgin Islands last year in the Miss NBCA Hall of Fame competition. Miss Morehouse College 2012-2013, Jasmine Mathews won the competition last year. The UVI community wished their ambassador luck and supported Murchtricia Charles as she vied for the title of Miss NBCA Hall of Fame.